For those of you not obsessively interested in your alcohol, you may have missed the news that the folks at Maker’s Mark had announced a fairly straightforward way to deal with increasing demand: watering down their 90 proof bourbon to be sold at 84 proof. As you might imagine, increasing supply of bourbon isn’t exactly a fast response as the aging process presumes a bit of “proper, prior planning”. So they figured, let’s just add water. Sell less bourbon per bottle, and voila! you’ve got yourself more bourbon available to bottle elsewhere. Well it turns out, in the “every piece of news is the end of the world, let’s tell everyone we know on twitter” world we live in today, that wasn’t going to fly so well with all of those folks who live and love Maker’s bourbon. As Nobler Mark said perfectly, “the increased demand was for 90 proof bourbon, not 84 proof bourbon” and I couldn’t agree more. It seems like a giant gaff for a successful brand to assume that just because they claimed the taste profile would remain almost identical, that loyal consumers wouldn’t mind paying the same for essentially less. Other brands (you see this a lot in non-alcoholic beverages) have quietly reduced packaging size to deal with similar issues and in these cases the response tends to be a bit more subdued; most people simply don’t notice the difference. But in the liquor world of pretty consistent bottle sizes, I’m not so sure this would have been an option either. Due to the quick and unified response to the news, Maker’s has already backtracked. 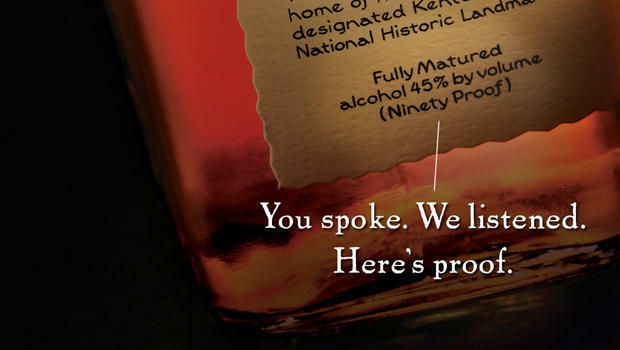 With a simple message “You Spoke, We Listened”, the bourbon will remain at 90 proof. So what if this was all just an elaborate scheme that was never meant to be fully executed. A few weeks of bad (but constant) press leads to the brand thanking its consumers for providing their strong opinions and essentially handing off the reins of brand management. “This is your brand”. Could it be that somehow this was intended from the beginning. Well some folks think its more than a bit reasonable and I think that says it all right there. So does any of this matter? Well not a ton for those who love their Maker’s. You have your 90 proof consistency and a bit of a “win” in your personal tally. But for brands and conglomerates a like, this is a scary example of just how quickly you can shatter what you’ve spent years building. We’ve developed into fickle consumers, and for those competing in a highly competitive (and increasingly so) industry, this isn’t exactly the greatest news. I’ve always been a whisky lover and Maker’s Mark was the next step in my Bourbon progression 20+ years ago when I was a Grand Dad and Ginger Ale kind of guy. That being said, I have pretty much ignored the brand once I moved on to other whiskies. Nothing wrong with Maker’s, but there is better and more interesting out there. As far as this ABV business, my neighbor was a big Jack Daniels fan until they too started watering it down. The more whiskies you try, the more you realize that potency matters. I’m guessing that all of this brand ambassador email business was part publicity stunt. The public and media outcry was pretty boisterous and it definitely brought attention to the brand. The question is, will this nonsense hurt the brand? Great points. I think the majority of passionate bourbon fans gloss over Maker’s with all of the fantastic options out there. It seems so much of the “excitement” came from the fact that we are all very “excitable” these days, particularly when it comes to feeling “cheated”. My guess is that the net result won’t be much but it’s a fascinating story of how brands must be more vigilant than ever. Totally agree. Social Media is a wonderful AND dangerous thing if it’s not managed properly. On the plus side, as a consumer, it’s great to have a voice that might actually be heard. I feel like this compares somewhat to the proposed Netflix business split between online steaming and rentals, but at a much smaller scale. Overall, I don’t understand why they didn’t take a page out of other spirits or beverage producers and make a new product line (Gatorade created G2, Michelob created Ultra, etc) that contained the lower percentage.